L 25″ (64 cm). Sexes similar. Description: Narrow, pointed, greenish-yellow bill, more slender in female than in male. Breeding adult with white belly, foreneck, cheek, and throat; upperparts dark gray-brown; black cap extends to below red eye; blackish stripe down hindneck. Winter birds with medium gray-brown upperparts, cap and hindneck. 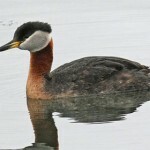 Habitat: Rivers, lakes and reservoirs while on migration. Breeding occurs on ponds and lakes with large expanses of open water, and on some large marshes. Where in Nebraska: A common and locally abundant spring and fall migrant in the western portion of the state and less common in the east. 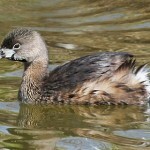 A locally common regular breeder in northern and western area. Field Notes: Nesting is colonial. 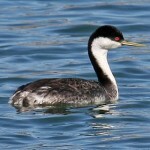 Large numbers of Western Grebe’s can be seen on Lake McConaughy in late April-early May and late September-early October. 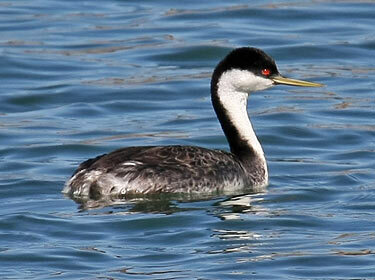 Fun Facts: Once a Western Grebe’s eggs hatch, usually a pair, both parents carry the young on their backs, while feeding them, and do not return to the nest.